Mary Lois Hinderliter was born in Oklahoma City, Oklahoma on December 16, 1936 and was the youngest child of Willie K. and Margaret Amanda (Mullins) Phipps. She went to be with her Lord and Savior Jesus Christ on February 2, 2019 while at home with her family. Lois moved to Mustang, Oklahoma in 1947 when her parents purchased a farm at the intersection of 152 and Sara Road. She grew up in a farmhouse on Sara Road that stands today directly West of Walmart and graduated from Mustang High School in 1955. On Thanksgiving Day 1955, she married Leroy Dean Hinderliter. The couple was blessed by the Lord with a daughter and a son and lived in Kansas City and Oklahoma City. In 1963, they built a house in Mustang on an acre of the original farm where Lois grew up, where she lived until her death. Their house was a short walk to the cedar tree behind the farmhouse where Leroy stole his first kiss with Lois. Before bucket seats and seat belt laws, she always sat in the center of the front seat right next to Leroy. Lois had a wondrous gift for service and served in many capacities during the 54 years she was a member of Chisholm Heights Baptist Church. Farm life in the late 1940s and early 50s gave her a strong work ethic and she grew and canned fruit and vegetables for all of her family’s meals. She served until there was no one left to serve and worked until the job was complete, always smiling and never grumbling or complaining. When her children were launched, she was the smiling face greeting and serving customers of Scott’s Goodyear in North Oklahoma City and enjoyed spending summers with Leroy in Eagle Nest, New Mexico. She is survived by Leroy, her husband of 63 years, her daughter Dianna and husband Richard Neaves of Oklahoma City, her son Dean and wife Lisa Hinderliter of Richardson, Texas, five grandchildren: Julia and husband Phil Schrader of Richardson, Texas, Grant and wife Rachel Hinderliter of Lookout Mountain, Georgia, Lucy Hinderliter, Lillian Hinderliter and Will Hinderliter, of Richardson, Texas and six great-grandchildren: Benjamin, Lyla, Jaye, Oliver, Cy and Ike. She is also survived by a brother, Pat and wife Patsy Phipps of Wilmington, Delaware. Her beloved calico cat, BG (short for “Baby Girl”), who joined the household eight years ago when Lois began her fight with cancer, will also miss her sweet presence. She was preceded in death by her parents, two brothers, Leonard Phipps and Donald Phipps, and one sister, Virginia (Phipps) Williams. A celebration of her life will be 10:00 a.m. Saturday, February 9, 2019 at Chisholm Heights Baptist Church with interment to follow at the Mustang Cemetery in Mustang, Oklahoma. Online condolences may be made at www.mcneilsfuneral.com. To send flowers or a remembrance gift to the family of Mary "Lois" Hinderliter, please visit our Tribute Store. 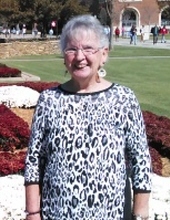 "Email Address" would like to share the life celebration of Mary "Lois" Hinderliter. Click on the "link" to go to share a favorite memory or leave a condolence message for the family.